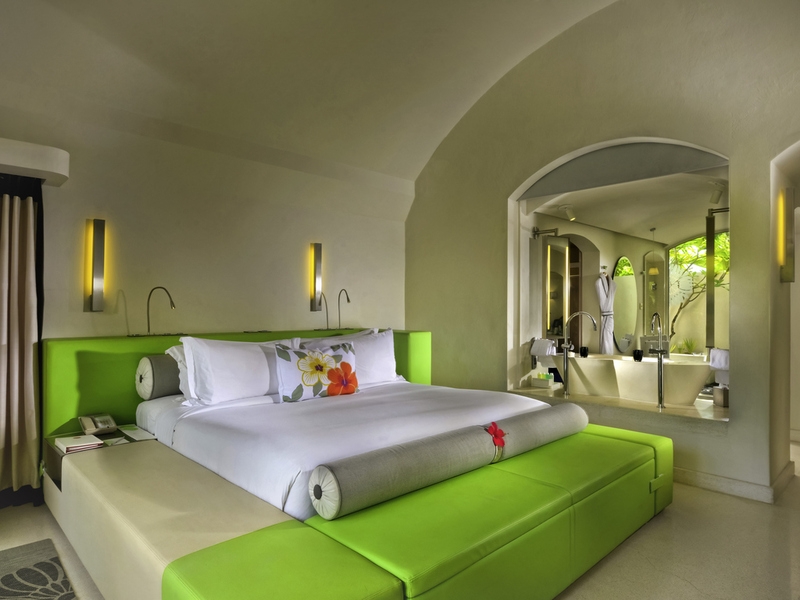 Inspired by the lush tropical nature of Mauritius' wild South coast, Kenzo Takada created SO/ Sofitel Mauritius as a unique new 5-star resort hotel in Mauritius. Come for pleasure, romance and relaxation, for spectacular cocktails under the stars, for haute cuisine blending Mauritian and French flavors. Come for beach barbecues sizzling with fish fresh from the sea, for dancing on the sand as the sun fades over a shimmering lagoon. Stay in peaceful rooms, suites and villas which flow into private gardens with outdoor showers. Relax at So SPA with treatments inspired by tea. Taste inspired cuisine at Flamboyant and La Plage, far from the hustle and hassles of everyday urban life. 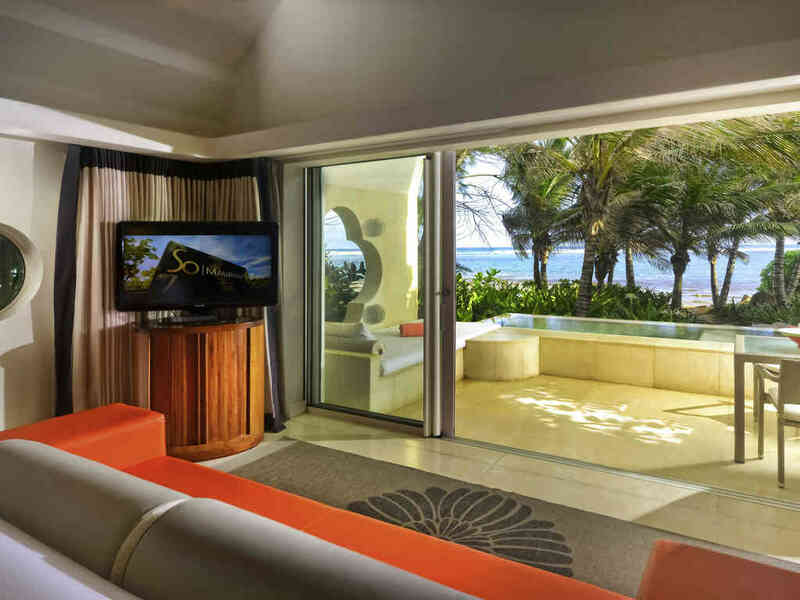 Life is Magnifique in Mauritius..
Our luxurious suites and villas offer sparkling ocean views and direct beach access. Tucked away on the southern coast, this secluded haven is perfect for a romantic getaway. Inner-harmony beckons at SO Spa with innovative products and a signature SO Hibiscus massage. 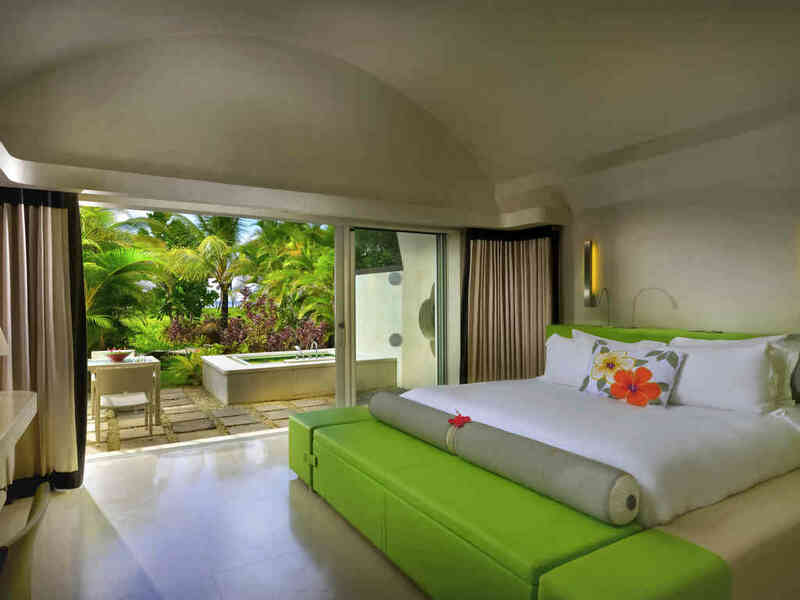 An oasis tucked away in a lush natural landscape, SO/ Sofitel Mauritius Hotel is a masterpiece of Thai architect Lek Bunnag and fashion designer Kenzo Takada. Inspired by hibiscus flowers, Takada's sleek design creates a sense of well-being and comfort. This serene sanctuary mingles contemporary elegance with French art de vivre. Upon arrival at the 5-star luxury resort, you will delight in breathtaking views of a sparkling turquoise lagoon surrounded by lush vegetation and flowering hibiscus. Retreating to your guest room, you discover pure tranquility and elegance. Gaze out from the terrace at white, sandy beaches and blossoming gardens. Then enjoy a shower scented with our signature tropical toiletries before sinking into a plush MyBed. After a blissful night's sleep, nourish your body and soul in the resort spa. Lavish in luxurious hammams or sink into open-air cold and warm pools for peaceful relaxation. A golden needle acupuncture treatment or soothing massage re-energizes you. Set in unsullied nature on the south coast's white sand beaches, this luxury Mauritius resort is perfectly located near an 18-hole golf course, the Frederica nature reserve with 4x4 trails and mountain biking, and the town of Bel Ombre, just 1.5 km away. From Sir Seewoosagur Ramgoolam airport, head for Plaine Magnien (M1), Riviere des Anguilles (B8) then Pont Souillac via the Savanne Road (A9). Then follow the coastal road (B9) to Beau Champ and So Sofitel Mauritius. Plunge into a MyBed; wake to Kenzo Takada lotions, terrace and perfect tranquility. Fringing a white sand beach, enveloped by lush private gardens with sun terrace and pool, these exclusive Mauritius villas seduce. A butler is on hand 24 hours. 60 M² / 645 SQFT, Gracefully integrated into the natural environment, Private garden with bathtub, External patio shower, Ensuite bathroom, Complementary WIFI, Bose Wave System, iPod docking station, Amenities designed by Kenzo TAKADA. 60 m² / 645 SQFT, Overlooking the lagoon, Private garden, Terrace & Patio, Butler Service, Free non-alcoholic Minibar, Complimentary WIFI, Ensuite bathroom, external bathtub and shower, Amenities designed by Kenzo TAKADA. 645 sq. ft (60 sqm), gracefully integrated into the natural environment, private garden, external patio shower, ensuite bathroom, complementary Wi-Fi access, Bose Wave System, iPod docking station, amenities designed by Kenzo TAKADA. 60 m²/645 sq.ft., Gracefully integrated into a natural environment, Private garden with bathtub, External patio shower, Ensuite bathroom which can accommodate a family of 2 adultes & 2 children. 100 sqm, gracefully integrated into the natural environment, private garden with its pool, external patio shower, complimentary WiFi access, Bose Wave System, Ipod docking station, amenities designed by Kenzo TAKADA. View the other rooms. 110sqm, gracefully integrated into the natural environment, alcove for children with 2 single beds, private garden with its pool, external patio shower, complimentary WiFi access, Ipod docking station, amenities designed by Kenzo TAKADA. Classic French and local cuisine merge in sophisticated Mauritius restaurant Flamboyant, while beachside La Plage offers a stylish lounge ambiance with tapas and fresh seafood. Vegetarian, hallal...our chef tailors each meal with creativity and flair. Hibiscus mojitos, local rum, spectacular fruit cocktails... even orange ice cubes for your chilled orange juice. Choose from two Mauritius bars: sophisticated Le Takamaka or relaxed La Plage for thriving beachside nightlife, Mauritius-style. Enjoy a fantastique epicurean experience at SO Lagoon for gourmet dishes on the beach. Treat yourself to a lavish lobster dinner under the stars at La Plage, offered once a week. Saturdays at La Plage are SO Groove with delicious tapas and the musical delights of DJ Vee. Combine work and pleasure by choosing our hotel to organize your meeting on the island of Mauritius. 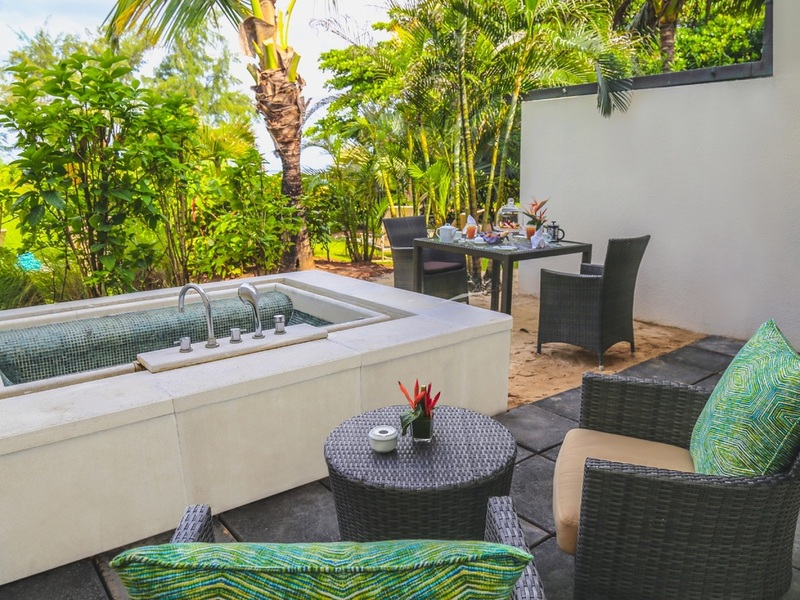 Beach villa is nestled in a lush natural setting with view over the Indian Ocean. The sober design and noble materials subtly combine with decorative elements designed by Kenzo Takada, reflecting the natural environment. A range of team-building activities are available on the island of Mauritius. Our 50m2 meeting room can comfortably accommodate 28 people. Ideal setting for an informal board of directors gathering within an unusual surrounding, benefiting of the possibility of coffee breaks organized by the private pool. Marry in Mauritius: an idyllic spot to pledge vows. We ensure your wedding in Mauritius is perfect, from flowers to photos to a celebration meal on the beach. Book a wedding or lune de miel package in this romantic Mauritius honeymoon hotel. Celebrate your love at our romantic island sanctuary where you'll discover endless pleasure and relaxation. As part of your honeymoon package, enjoy a delighful dinner in paradise, a sparkling bottle of champagne, couple's massage and special gift. Arrange catamaran cruises, swimming with dolphins, whale watching, tours, free water sports, tennis... the hotel's activities center has over 60 options. 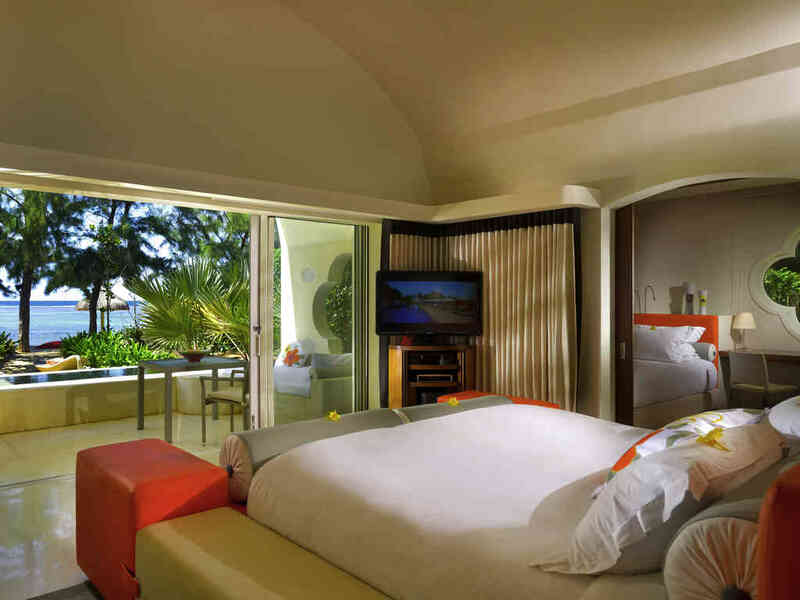 Sofitel So Mauritius is a family-friendly resort, with a useful shop and Villa des Enfants for kids. Imagine exploring Mauritius in a luxurious limousine. As part of our limousine service, we offer a BMW5, BMWX5 or BMW7 complete with chauffeur. To book a limousine for the day or your entire getaway, please call the reservation office. We invite you to slip into our luminous outdoor swimming pool, uniquely shaped like a panga knife, used by locals to cut sugar cane. After a soothing dip in sparkling waters, lounge on a nearby sunbed with a refreshing cocktail and freshly grilled fish. Book an exclusive golf package on Mauritius' south coast, at a beautiful course near the resort of SO Sofitel Mauritius. The hotel's dedicated staff will help with top quality golfing equipment, buggy rental and golf lessons for adults and children. Relax with a vigorous workout in our intimate, nature-hugged Mauritius gym: a So FIT fitness studio. Equipped with the latest cardio machines and weights, you can book a session with a personal trainer or play tennis in the open air.